The measles virus is spread via droplets from the nose and throat of people infected with measles. Measles is a highly infectious virus infection of the respiratory system. The main features are flu-like symptoms – a high fever, runny nose, hacking cough and conjunctivitis (red eyes,) leading up to the appearance of a typical skin rash that usually covers the entire body. The measles virus is spread via droplets from the nose and throat of people infected with measles. Complications, which include middle-ear infection, croup, pneumonia, diarrhoea and encephalitis (inflammation of the brain), can be severe and in rare cases even fatal. Measles was first described by Rhazes, a Persian physician in the 10th century. A Scottish physician, Francis Home, demonstrated that measles was caused by an infectious agent in 1757. In 1954, the virus that causes measles was identified in Boston, USA by John Enders and Thomas Peebles. The history of measles underwent a complete change with the introduction of the measles vaccine in 1963. Even today, despite the availability of a vaccine, measles remains one of the leading causes of death in young children all over the world. 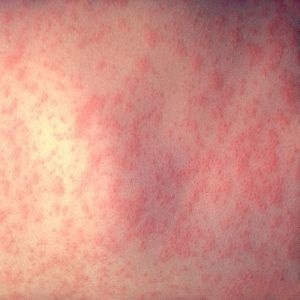 Measles is a human disease and doesn’t occur in animals. Reviewed by Prof Eugene Weinberg, Paediatrician at the University of Cape Town’s Allergy and Immunology Unit. April 2018.